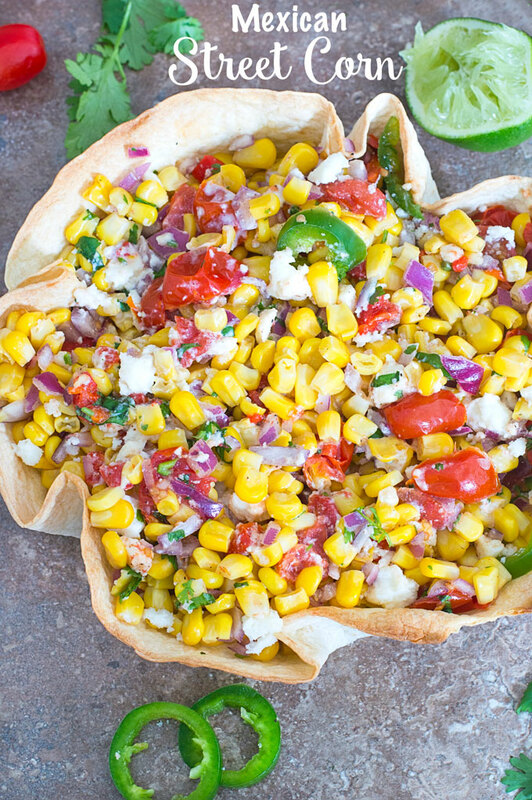 This Vegetarian Mexican Street Corn is made with sweet corn and mixed with roasted cherry tomatoes. Served in a homemade Taco Bowl. This vegetarian elote recipe is my favorite comfort food recipe. I used Mexican Corn ingredients which includes a little spice! Are you a fan of street foods? Do you go hunting for food trucks over the weekend? I am a huge fan of all kinds of street food. Especially if it is Mexican food. Summer time means that there will be food trucks roaming all over and I just can’t wait to try all of them. I have seen loaded Mexican fries, empanadas, bite-sized enchiladas and 10 ingredient burritos. That is some serious street food! The idea behind street food is that it can be mobile. So, I put them into homemade taco bowls. When the corn is wolfed down, you can devour the bowl too. What could be better! 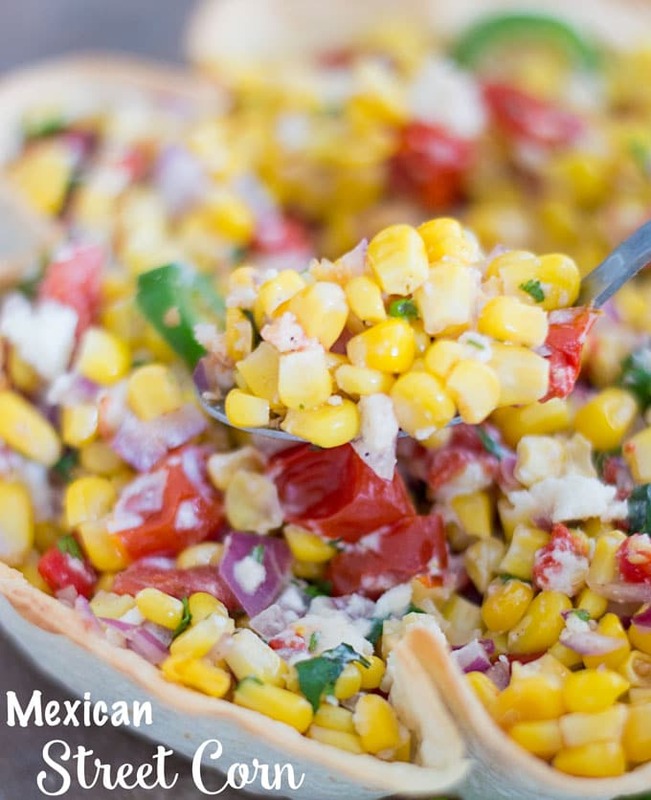 In this Mexican corn recipe, I decided to add cayenne pepper because I like my Mexican food to have a little kick. The jalapeno add heat, but, cayenne adds a little spice and flavor. For this corn, I decided to keep it as simple as possible. The only thing that takes time is roasting the cherry tomatoes. 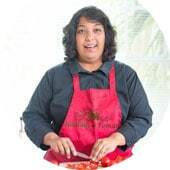 While the cherry tomatoes are roasting, you can chop / assemble the other ingredients. 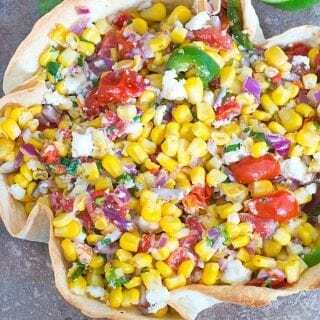 Sweet corn, red onions, chipotle peppers in adobo sauce, jalapeno, cotija cheese, cilantro and lime juice come together in this Mexican street corn recipe. It has elements of sweet, spicy and tang which make them absolutely perfect comfort food. If you like this vegetarian elote recipe, you are also going to love my mexican corn on the cob elote recipe. I roasted corn in the oven and then rubbed the top with my spice blend and lemon. You have to try it to see how delicious it turned out. 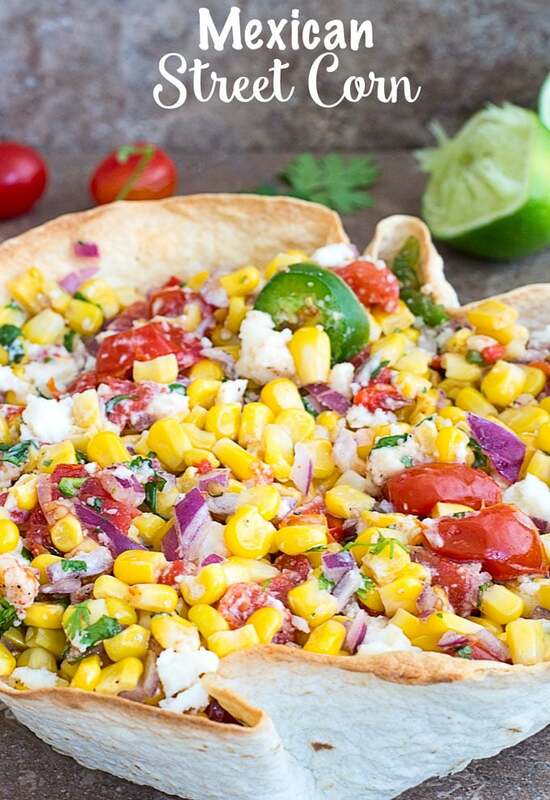 This Vegetarian Mexican Street Corn is made with sweet corn and mixed with roasted cherry tomatoes. Mix well and then transfer to taco bowl. So many great flavors in this dish! Love the taco shell bowl! Thank you so much! I am so glad you liked it. This is fabulous! Love all of these flavors!